McKee's 37 + Grit Guard® = swirl-free paint! Washing your vehicle with dirty water is like an unintentional wet-sanding! The tiny grit and sand that comes off your vehicle goes right back onto the paint every time you dip your mitt in dirty water. Keep your wash water clean with the McKee's 37 Complete Wash System with Dolly. The Grit Guard is the revolutionary tool that keeps your wash water clean! It stabilizes the water and allows dirt to fall to the bottom of the bucket where it can’t recontaminate your wash tools. No swirls or scratches! The McKee's 37 Complete Wash System will help prevent the most common form of paint damage so you can wash with confidence! 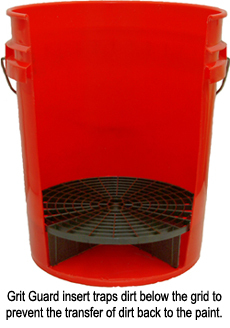 Bucket available in red, clear and black. Great item, a must have! Just as the described. Easy to roll around while sitting on it. A must have to really get the washing job done on ypur car. ProsGreat back saver. Let all the grime and grit go to bottom of bucket. Made very well.